As Jade attempts to settle in, nothing feels right. God seems far away, she’s hiding secrets from her family, and she’s strangely attracted to the man who’s always called her “squirt." Finding her way home may prove more difficult than she imagined. 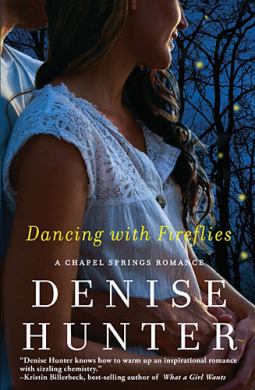 Denise Hunter's latest book in the Chapel Springs series is a page turner. There is a lot that happens in this book - some good and some bad and it makes for a different read for Hunter fans. I don't want to spoil anything, so I'm not going to mention plot details, but much of the stuff dealt with in this book has a serious tone to it and it was a little hard for me to read it at times. Jade goes through an awful lot in this book to say the least and quite honestly how she found the space in her head for romance amazed me. She's a strong girl, but like all strong girls tends to carry too much on her own for far too long. Daniel, a man who might as well be her brother has loved Jade for years - so much so that he's willing to do an awful lot just to have her in his life. Jade and Daniel work it out - there's a lot to work out here and Denise does her trademark first kiss scene brilliantly but this book didn't win me over. It felt a bit flat and it didn't truly address the issues the characters faced - especially Jade. Others might love this book and be really moved by it and I hope that is the case!